MetaGeek was the first presenter at Wireless Tech Field Day and kicked off the event with a superb presentation and demonstration of their flagship products, the Wi-Spy DBx and Chanalyzer Pro. The MetaGeek Wi-Spy family of wireless spectrum analysis adapters offers Wi-Fi engineers a workstation-based wireless physical layer analysis solution at a much lower cost than competitive products such as Cisco Spectrum Expert or AirMagnet Spectrum XT. Ryan and Trent started off the presentation describing MetaGeek's roots as a company. Back in 2005, Ryan worked as a wireless protocol developer for semi-conductor company that manufactured parts for wireless mice. The company began experiencing problems with 2.4GHz mice not working properly, and narrowed the problem down to times when large amounts of Wi-Fi transfers were occurring. Ryan was dispatched to Japan to work with partners to resolve the issue. As any IT engineers is well aware, the first step in troubleshooting is to accurately replicate the issue on-demand. At first, an intern was assigned the task of repetitively drawing circles with the mouse for data collection (poor schmuck!). And the cost of an industrial automated mouse tester proved prohibitive. However, Ryan developed a more elegant solution to automate the process using an unconventional technique that geeks will especially enjoy: Legos! 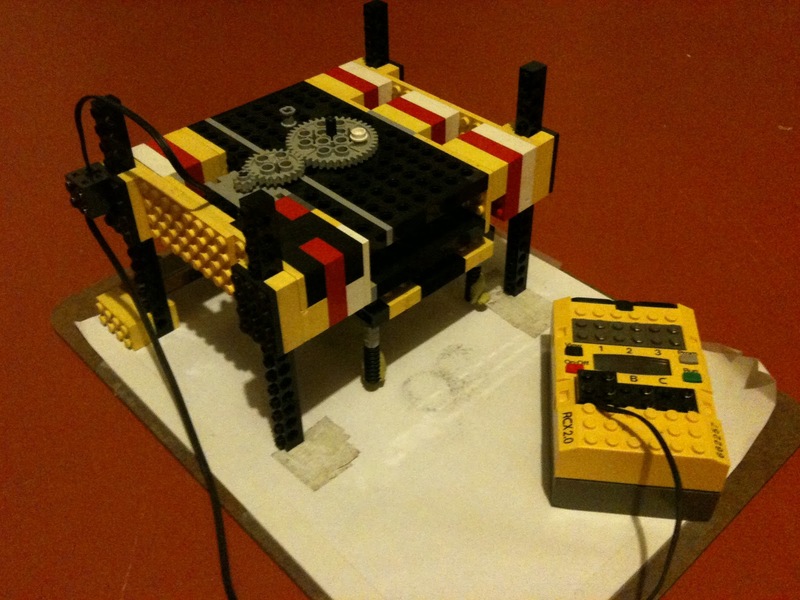 The Lego mouse tester (it's official name) was controlled by a Lego RCX unit to provide variable speed and timed tests. The mouse tester allowed the company to accurately replicate the issue and provide a volume of data necessary to identify the interference issue, quantify impact, and develop a resolution. What's more important, is the experience got Ryan thinking about how to create an effective spectrum analyzer to observe and quantify the source of the problem, the RF environment. Thus, the first Wi-Spy adapter was born from the modification of a wireless mouse dongle! MetaGeek still provides employees with 20% time to work on side-projects and keep innovation alive (as they have time and time again over the last 5 years)! The Wi-Spy adapter family and Chanalyzer software have evolved over time to provide a feature-rich spectrum analysis solution for inexperienced and "multi-hat" administrators, as well as professional wireless engineers. The Chanalyzer software's main display provides core RF information in the density and waterfall graphs, with additional relevant information such as duty cycle, networks, and channel data in tables in the lower pane. The best feature of the product, without a doubt, is the density graph (displayed above). This density graph shows similar data to the real-time fast fourier transmission (FFT) of other products by displaying RF data in an amplitude over frequency format. However, the RF energy is color-coded either by density (the collective amount of energy at specific points over time) or by amplitude (the energy intensity). This really make RF signal patterns "pop" as data is collected over time, allowing much easier pattern recognition by the user. This is what makes the tool simple and intuitive for users inexperienced in RF spectrum analysis. MetaGeek pioneered the use of the density view in 2007, and has since been adopted by AirMagnet (but not Cisco/Cognio). I still find MetaGeek's implementation the best. Another great feature of the product is time segment analysis using the waterfall timescale panel on the left in Chanalyzer Pro (shown left). This allows the user to capture, pause, and rewind spectrum data to isolate and review potential issues. Additionally, the configurable time span being viewed allows the user to focus in as narrowly or broadly as required to pinpoint the pattern requiring further analysis. Spectral anomalies can easily be identified in the timescale, and hovering over a section presents a preview of the density graph at that point in time. Time segment analysis unifies the data in all other graphs and tables for complete replay capability. The feature is invaluable when performing spectrum surveys or for remote analysis by an expert after the issue has occurred. Competitive products also offer time segment analysis, but not as intuitively or comprehensively as Chanalzyer Pro in my opinion, offering recording and playback but not timescale previews that allow the user to quickly navigate to the point in time of most interest. Chanalyzer Pro includes numerous other features, such as a report builder, device signature overlays, Wi-Fi network identification and overlays, and channel statistics. To wrap up their presentation, MetaGeek showed us advanced previews of a few products and features they are actively working on. This provided the delegates opportunity to provide insights into how they use spectrum analysis products and desired features. Ryan showed a live prototype of an iPad application for playback of recorded spectrum captures, which was a hit with the delegates to be sure! The need for portable Wi-Fi tools is always top of mind for wireless engineers, and MetaGeek has their sights on targeting that need in their products. Other previews included work being performed on directional antenna prototypes for device locationing (similar to the current Device Finder antenna they offer), and remote spectrum sensors embedded in Pogoplug units. This will allow remote monitoring of spectrum at distributed offices, or on-demand shipment of a spectrum analysis solution to sites and installation by on-site personnel with minimal training involved. This reduces travel expenses for organizations to resolve wireless interference issues when expert staff is centrally located. Coupled with on-board storage and a remote access to the unit, this solution could be a killer feature for medium and large organizations. MetaGeek is a clear innovator in spectrum analysis. The company is focused on product differentiation and aggressively developing features to meet customer needs. What's more, the product provides comparable capabilities, and even better in many instances, than higher priced alternatives. The Wi-Spy is a great tool for both the inexperienced as well as the professional wireless engineer. What also excites me about MetaGeek as a company is their solid grasp of customer requirements and a simple yet powerful user experience. Ryan, Trent, and team really listen to customer feedback and use it to drive product direction that makes sense for the company and remains relevant for users. The Chanalyzer software does have a few gaps that should be noted. MetaGeek does not provide an in-house wireless site survey solution, but partner to integrate Wi-Spy into the VisiWave tool to map interference. Also, device identification has been a feature in flux for the company. They have created a large community forum for users to upload and share device signatures, and have integrated a few verified signatures into the Chanalyzer software. However, automatic device identification is not available; users must manually correlate observed RF patterns to the signatures. MetaGeek also offers InSSIDer for Wi-Fi network discovery, Device Finder for interferer location via a directional antenna, and GPS integration with Google Earth maps. 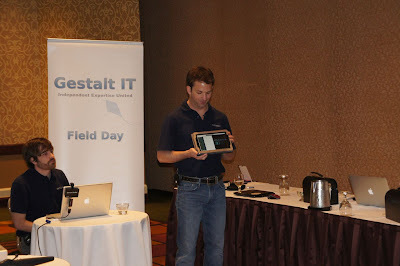 Tom Hollingsworth recapped the MetaGeek WTFD presentation. George Stefanick reviewed the Wi-Spy product line. Sam Clements got some hands-on time with the Wi-Spy. Chris Lyttle compared Cisco CleanAir versus Atheros spectrum analysis solutions. MetaGeek explained the importance of Time Segment Spectrum Analysis.